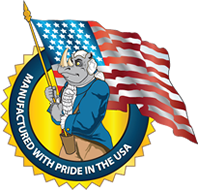 Our RHINO brand gutter protection systems were developed after years of research and experience in the gutter and gutter protection industry. That experience was used to create one of the most technologically designed gutter protection systems on the market today. From the size and shape of the holes openings to the degree of slope or arch on the products surface, the Rhino Gutter Guard systems are truly a product that is ahead of its time. We have been manufacturing and designing roll forming machines for gutter protection systems since 2002. Its a difficult process that has taken us years to perfected. Because of this explicit understanding of these processes, we are able to manufacture our products so efficiently that our overhead is substantially lower than our competition. The resulting savings are passed directly to our contractors, who in turn pass those savings on to the homeowner. You will not find a BETTER product for the money anywhere in the market. RHINO GOOD is a micro-expanded aluminum product yielding small diamond shaped holes that prevent most debris from entering the gutter system. The non-flattened nature of the surface creates a network of speed bumps to decelerate water velocity, thus augmenting water dissipation while inhibiting debris from sticking (minimum contact of the debris to the surface area). The unique arch shape of the product also affords forward sloping for rapid debris shedding and the plateau in the rear of the product ensures that water and/or debris cannot migrate backwards towards the fascia board. The front leg of the product snaps in under the front lip of the gutter and guarantees that there will never be any water overflow and the back leg of the product rests on the hidden brackets for the gutters.Since this is not a micro-mesh product, some very small debris may enter the gutter, but it will keep leaves, twigs and most pine needles out. Smaller debris (shingle grit, etc.) may enter the gutter or lodge in the holes over time and it may be necessary to clean or remove some debris (inorganic & organic) from the system to maintain the proper performance. 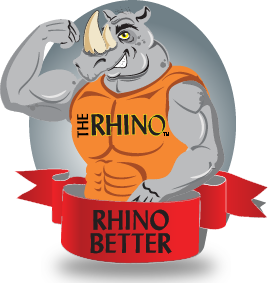 As with all RHINO products, NO roof or shingle contact is required. RHINO GOOD is manufactured from 3000 series aluminum and is roll formed to achieve its shape. Integral over and flat bends at the edges create robust product strength. Open area yield is 45% and the diamond hole openings are LWD .150" and SWD .100". 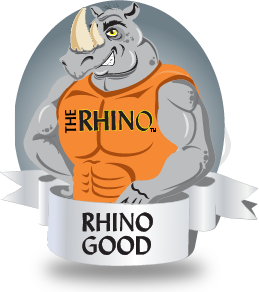 RHINO GOOD is patent pending. RHINO BETTER is a stainless steel micro-mesh over expanded aluminum product that yields the optimum micron size (440)to prevent all debris from entering the gutter system. The unique arch shape of the product also affords forward sloping for rapid debris shedding and the plateau in the rear of the product ensures that water and/or debris cannot migrate backwards towards the fascia board. The front leg of the product snaps in under the front lip of the gutter and guarantees that there will never be any water overflow and the back leg of the product rests on the hidden brackets for the gutters. The micro-mesh technology will ensure that leaves, twigs, pine needles,oak tassels,shingle grit and other small debris will never breach the system to migrate into the gutters. The mesh is strategically sized to allow passage of pollen and dust so it is washed through during rainfall.It may be necessary from time to time to clean or remove stubborn debris (inorganic & organic) from the mesh surface to maintain the proper performance. 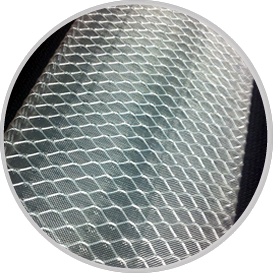 RHINO BETTER is manufactured from 3000 series aluminum and stainless steel mesh. 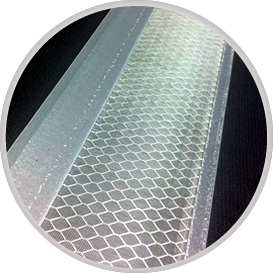 The mesh is "hemmed" over the expanded metal and then roll formed to achieve its shape creating unprecedented lateral tension of the mesh, forcing it to be in constant contact with the substrate.Integral over and flat bends at the edges create robust product strength. Open area yield of the mesh is 57%. RHINO BETTER is patent pending. RHINO BEST is a stainless steel micro-mesh over expanded aluminum product that yields the optimum micron size (440)to prevent all debris from entering the gutter system. This product utilizes a .024" aluminum body and lip that is mechanically fastened over the mesh laminate, creating an exponentially stronger product, in both compression and tension.The embossed texture feature deters debris from "sticking" to the product by minimizing surface contact area, thus augmenting the debris shedding. The front leg of the product screws to the front lip of the gutter and the back upward bend (fascia shield) allows it to be screwed directly to the fascia, creating a slight forward slope. This installation creates unprecedented"box girder" strength, making the gutter assembly, which is inherently weak by nature, a completely closed member.The micro-mesh technology ensures that leaves, twigs, pine needles,oak tassels,shingle grit and other small debris will never breach the system to migrate into the gutters. The mesh is strategically sized to allow passage of pollen and dust so it is washed through during rainfall.It may be necessary from time to time to clean or remove stubborn debris (inorganic & organic) from the mesh surface to maintain the proper performance. 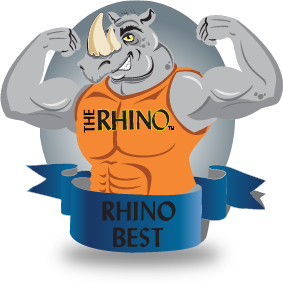 RHINO BEST is manufactured from 3000 series aluminum, stainless steel mesh, and 3000 series "embossed" aluminum (for the body and lip). 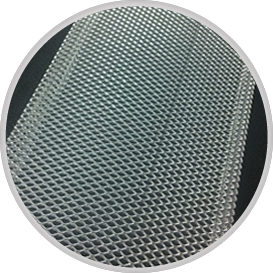 The mesh is "hemmed" over the expanded metal and then roll formed to achieve its shape creating unprecedented lateral tension of the mesh, forcing it to be in constant contact with the substrate. 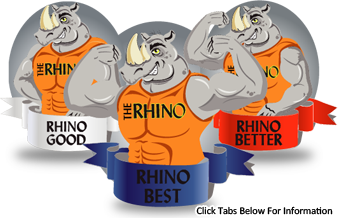 RHINO BEST is patent pending.